The image browser screen shows thumbnails of all the images you’ve uploaded. The idea here is that you can quickly browse through the images to find what you want. In all of the screenshots, clicking on the image itself will take you to the image’s detail page. The image browser will also have a filter mechanism so that you can winnow down the images to just one story, for example. If you’re familiar with Hiveword’s Scene list filter then you already know what to expect. If you’ve used Hiveword Plus then you know that the Notes feature allows you to attach notes to things (scenes, settings, etc.) or leave them as free-standing unattached notes. The same idea applies to images. 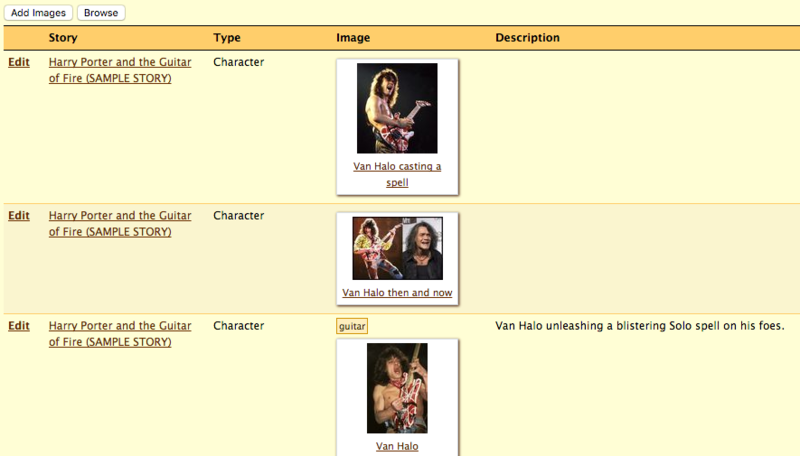 In the next screenshot you’ll see the Van Halo character page where I’ve attached images to the character himself. 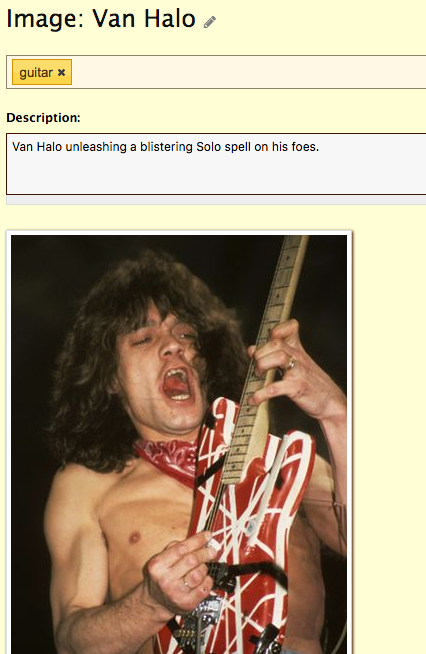 The image viewer on the character page can be expanded (to see the images) or minimized (to get them out of the way). As you can see, you can add images directly from this page with the Add Images button. When you click on an image you are taken to the image detail page where you can name the image, add tags, or write about it. The first screenshot I showed you was the Image Browser which showed a condensed view of all the images. A related view called Image List is a combination of the browser and image details which you can easily scroll through. Note that this page shows an image’s tags, description, and what it’s attached to (if anything). Like the Image Browser screen, the List view will also have the filtering capability. There you have it — a whirlwind tour of the forthcoming image upload capability. One thing I didn’t mention is just how the heck you get the images into Hiveword in the first place. Luckily, that’s pretty simple. There’s a special upload screen that allows you to add images via a file picker or drag and drop. It’s utterly simple to use. The image upload feature is part of Hiveword Plus which is the paid upgrade to basic Hiveword. Plus currently offers custom types and fields, a journal, notes, and (shortly!) images. If you are interested in Hiveword Plus you can save money by signing up now because the price will be going up after the image feature is added. Right now, Hiveword Plus is available for $25 per year and you’ll be locked in for life at that rate even when it goes up. $25 is $2.08 a month. It’s a steal! After all, $2.08 won’t even get you a Starbucks latte. I’d love to hear your thoughts on this new feature and any ideas you might have related to it. Feel free to comment below or shoot me an email at mike.fleming@hiveword.com. I decided this week to participate in Nanwrimo (national novel writing month) and started on Hiveword Plus to build a framework for the story. Love the idea of being able to have photos/images in the same place as my notes. I love using hiveword as a place to keep my story ideas so I can go back to them down the road. Thanks! I’m glad you’re excited about it, Celeste. I am, too! Good news: This feature will go live tomorrow morning.